So, I know I am bad at baking, but I wanted to give this recipe a shot. I never in a million years thought that I’d make homemade bread. Surprisingly, it turned out great! In a large bowl or bowl or a stand mixer, add all ingredients and mix well. Knead on low 7 minutes in mixer or 10 minutes by hand. Transfer to a large greased bowl. Flip the dough to grease the bottom and cover with oiled plastic. Let rise in a warm place until doubled. Heat oven to 400 degrees. Line a large baking pan with parchment paper. 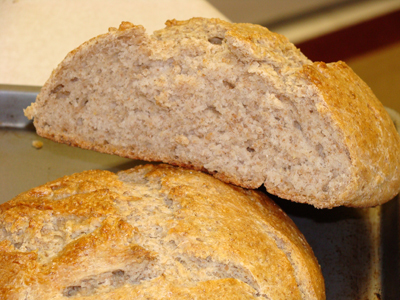 Punch down dough and form into 2 oblong or round loaves. Place on prepared pan, cover with oiled plastic and let rise until almost doubled. Brush risen dough with egg whites for a shiny crust or plain water. Make 4 diagonal shallow cuts with a knife in the dough. Bake 25-30 minutes or until internal temperature on an instant-read thermometer registers 190-195 degrees. Cool on wire racks. Oh I love rye bread. Never tried making it with buttermilk. Sounds great! This is my fav one….looks beautiful! I’m not big into baking either. Love cooking, but baking is too precise for me. I like to improvise and you can’t do that baking. I’m so impressed. Your bread looks like and delicious!